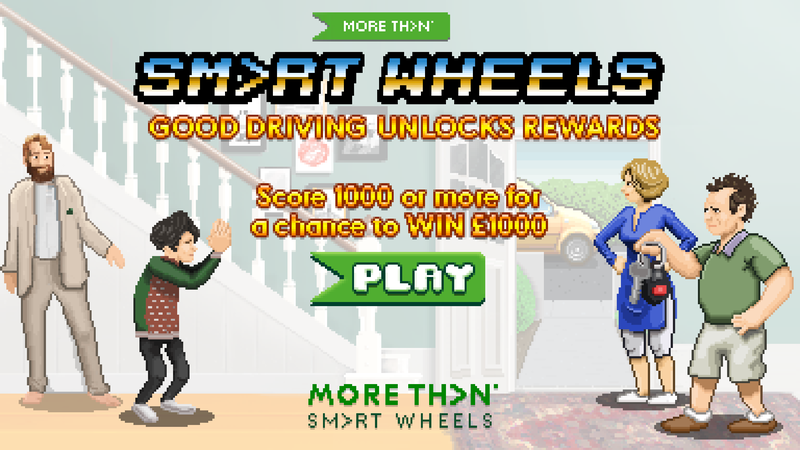 Working with VCCP, we developed an HTML5 game as part of the More Th>n campaign to promote their ‘Smart Wheels’ car insurance which rewards safe drivers. The game is aimed at young drivers and their parents with the key objective of raising awareness about More Th>n Smart Wheels car insurance. More Th>n Smart Wheels car insurance monitors driving style via a ‘black box’ and rewards safe driving. The HTML5 game mirrors this, but in a slightly more tongue and cheek fashion and all in a retro 16-bit gaming style. Simple controls are key to mobile gaming so we stripped them back to have the whole of the left and right screen for interaction, removing the need for on screen buttons that can obscure gameplay. The 16-bit style pay’s homage to classic side scrolling games like Metal Slug, Double Dragon and Narc. Narrated by More Th>n’s fictional founder ‘Mordenn’, the aim of the game is stick to the rules and be the safest driver possible; slowing for cars, stopping at zebra crossing’s for old ladies and collecting exquisite driving gloves along the way. And there’s a chance to win £1000 to boot!